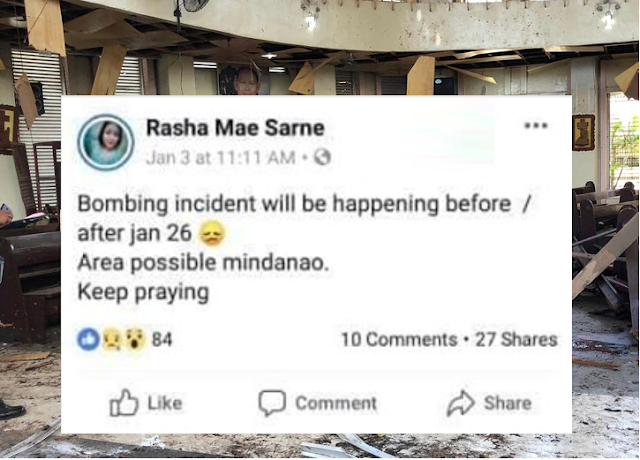 People was shocked about this post by a Facebook user Rasha Mae Sarne,"Bombing incident will be happening before / after jan 26 with a sad face emoji Area possible mindanao Keep praying". The post that was shared January 3, 2019 by Sarne exactly happened with twin blasts, killing 21 people and wounding hundreds of worshipers during a Sunday Mass at the Roman Catholic cathedral. Sarne's precognitive dream has been proven during an earthquake in Davao, landslide in Negros Occidental and currently the Jolo, Sulu Bombing were she posted on her Facebook account before it happen. As of the posting when we visited her Facebook account she reveals another premonition that will be happening next month, meaning that is for the month of March. "Bagyo paparating nxtmonth..Update ko lng medyo malabo pa..........."
Whatever Sarne's premonitions true or not, it's better to be prepare for whatever challenges that would lies ahead. Keep safe everyone!